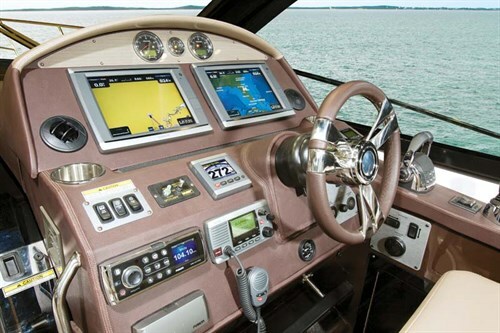 The Regal 42 Sport Coupe (SC) is a luxury American boat that combines quality, ingenuity and IPS pod drives that are a dream to drive. When it comes to recreational boating, the ability to combine sport, cruising, luxury and lifestyle into one boat is no doubt one hell of a task to get right. Well, if there is going to be one luxury boat builder that comes close it’s most certainly American boats manufacturer Regal Marine in the States. Take a closer look at the Sports Coupe fleet of Regals and you’ll find a Regal 35, 42, 46 and 53 on offer. And well, they’re all really cool boats and to be honest, it would be pretty damn hard to make the decision on which one suits my fashionista and debonair personality the best. Out of the bunch the Regal 42 Sport Coupe is probably the ideal in-betweener, loaded with incredible advanced technology and stunning exterior and interior design, she drives like a sportsboat and is too-easy to operate. Best of all, this girl comes in at around $700K less than the queen of the fleet 53SC, at a base price. Although substantially smaller than the Regal 53SC, the Regal 42 Sport Coupe still sports lavish amounts of fantastic inclusions and luxuries to make it just as attractive. Externally the modern design of the hull with subtly dated lines is far from over the top and I quite like it – an appealing combination between original and new when it comes to aesthetics. At-a-glance, on-water entertainment, local ocean and island adventures and comfortable luxurious living aboard screams out. Getting on board the oversized duckboard/boarding platform not only serves as an easy way to enter marine luxury but is also the ideal platform for flippering off into the deep blue on a diving adventure in the Whitsundays. If need be, or as in my case, I would probably have some form of fishing apparel hanging off the back as well. 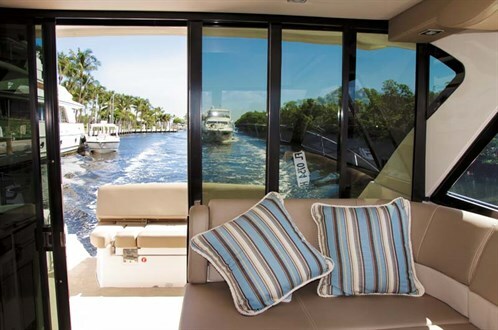 Dual side-transom walkthroughs take you to the rear deck fitted out with a central lounger that converts to a full rear-facing daybed. As tested there was another lounger adjacent, as well as outdoor wetbar with electric side grill for some big T-bones and a drinks fridge to chill the day’s beverages. Depending on the model or options the outdoor rear deck can be configured to suit. There are a number of different filler seating options, as well as the choice of a single level through to the cockpit rather than being separate from the enclosed cockpit. 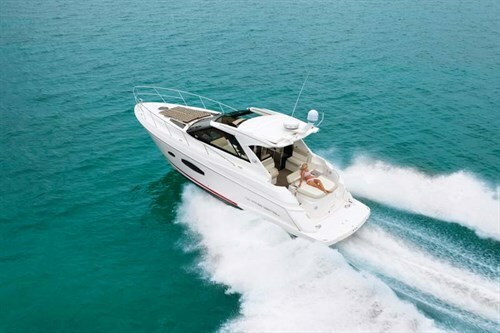 Either way, the Regal 42 Sport Coupe can easily be optioned to suit your climate. Within the confines of the enclosed hardtop the 32,000btu air-conditioner, running off the 7.6kW Westerbeke generator, was most welcoming considering the 35°C-plus Key West temperature and humidity that felt more like 500 per cent. Inside consisted of a spacious and comfy portside lounge with teak table insert, as well as drop-down flatscreen TV, prep/drinks station, spacious dual captain’s seat and a superbly rigged helm station loaded with the latest in marine technology including Garmin, Fusion and Volvo’s new IPS drive controls to mention a few. To top it off this area is light and airy, and with the flick of a switch the retractable sunroof transforms the enclosed hardtop into a convertible for natural ventilation and further lighting. 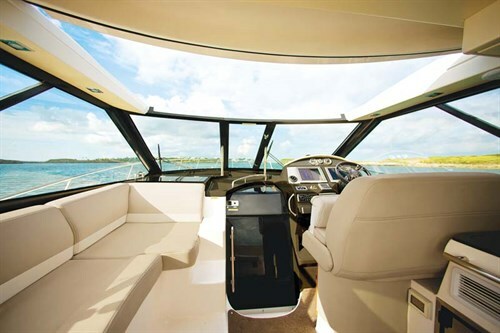 The Regal 42 SC even has a full windshield walkthrough to the bow which, by the way, is another fully usable area when optioned with the daybed cushions. If that’s not enough of an attraction already, then down below in the saloon/cabin and staterooms, the features, subtle colours and beautiful finishes make it feel more like a six-star hotel on the water rather than just a boat. Again, this is another well thought-out area with a well-equipped and classy looking hardwood galley incorporating freezer, fridge, microwave, electric two-burner stove, and is even preloaded with all the necessary cutlery and crockery. 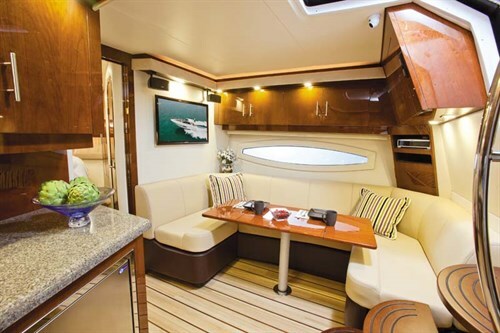 The spacious lounge with dinette is adjacent the galley keeps it social and if needs be, the lounger also converts to an extra double sleeper for extra guests or kids. When the entertaining is over a tranquil night’s rest awaits you in either the forward or aft staterooms. The forward master stateroom has queen-sized bed with inner sprung mattress, good storage options, a separate head and shower, plush linings throughout, and all very luxurious indeed. 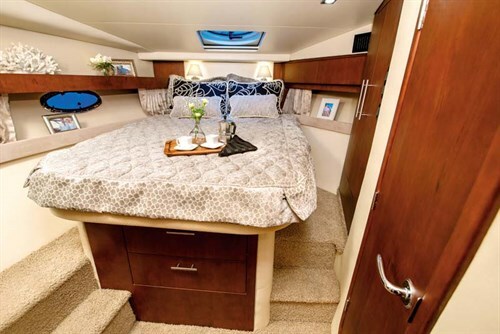 The aft stateroom is another luxury abode that’s spacious, has a twin single bed layout with inner sprung mattresses as standard, decent storage options, and like the rest of the boat is comfortable and smartly trimmed throughout. Sporting the latest in the Volvo Penta engine technology the Regal 42 Sport Coupe’s twin D6 diesel IPS500s produce more than adequate torque and horsepower to push this sportscruiser around. Boasting a total of 740hp through IPS pod drives, an electronic shift makes operating all this power so smooth and easy. For docking and slow manoeuvring it’s just a matter of toggling the joystick to control side movement off the docks, like a PlayStation game control but far easier to use. 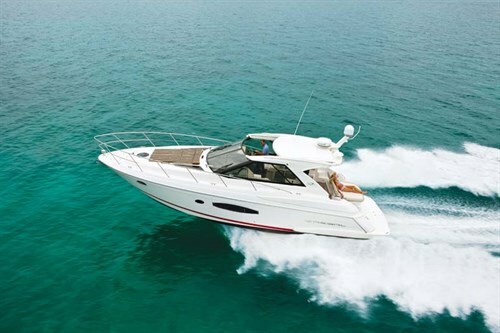 Underway the Regal 42 Sport Coupe powers up pretty quickly and smoothly edges itself up to standard cruise speeds with ease, maintaining a very comfortable and soft ride throughout. The Regal 42 SC gets up to a fair top end at WOT and is quite manageable, actually if you really wanted to you can throw it around like a smaller sportsboat and it handles it with no problem. Personally, to go with the executive luxury onboard I preferred to just sit back and relax at a mellower and civil cruise speed where noise was nonexistent. You could also get up and walk around and simply just enjoy the ride while sipping on a cold one. If anything I would add the Seakeeper stabiliser system if budget allows, as they really do make a difference on the stability side. The Regal 42 Sport Coupe is truly an entertainer’s dream, a fantastic family boat, a luxurious cruiser and in fact, just a top-class all-rounder. There is so much and more to these boats that you can’t even come close to touching on all the features, so if this is something similar to what you are looking for, then it’s well worth taking the time to flick through the full specs and inclusions online.